When it comes to most houses, the front steps are usually shown the servants’ entrance. Next to what real-estate agents like to call “curb appeal” – the fetching come-hither look of a property that makes you want to stop your car and see more of the place – the most important first-impression portion of any house is its front step … and, yet, it is, in arslocii terms, one of the most terribly overlooked, in all senses of the word. Money is spent on the front yard, on the path to the front door, on the plantings bordering the front step … but, then, those few flat rises to the door are usually just … flat. After what should be an orchestrated, even ceremonial transition from public space to private, the visitor ends up walking onto and standing around waiting on beige or brown or gray, poured or sliced or milled rectangular solids of no consequence. What a wasted opportunity to create a place for art, a place that, even before the front door opens, tells the visitor something about the personality of the house and the people who dwell in it. It’s an unfortunate dead zone instead of what could be not only one of the best and first greetings to a home but also an unexpected place for creativity and even wonder – an opportunity to create placeness. All that most people do is cover the top step with one of a slew of same-old, same-old cookie-cuttered, mass-produced mats – rubber or cocoa fiber or some synthetic approximation of one or the other of them – with pre-fab designs or T-shirty/bumper-sticker-ish verbiage that can be found by the truckloadsful (and the shiploadsful, coming from Taiwan or Sri Lanka): “Welcome” mats that coyly say “Keep Out,” mats with flowery or geometric patterns, mats with representations of the kind of animal one will encounter and surrender his pants cuffs to upon entering the house, or the sort of weapon the householder keeps at hand, or the politics that might explain the weapon, mats that stake a claim to the turf by having owners’ names imprinted on them … this stuff, available in stacks in big-box superstores everywhere is, apparently, what goes for “personalization” these days, as well as a signal of current American standards. But there is nothing personal about them; in fact, just the opposite: they trumpet conformity, the safety in numbers, the lack of introspection, the absence of a certain kind of pride. More thought goes into the selection of the brass-or-brushed-chrome doorbell and “custom” house numbers than this precious portal plot. 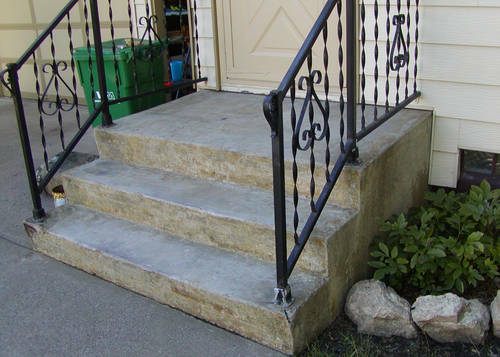 We don’t say that making something of your front step won’t take some effort – it will, if done right. But, you may ask, why do it, if it’s not easy, and so few people will see it? Because, besides creating a special, hip and hidden spot, when done it will not only be something that is by you but also something that is you, something of you that extends beyond the doorjamb to envelop your guests – something that, conceivably, will live on after you, or just until the next owner puts her imprint on the space. Take the example, just below. 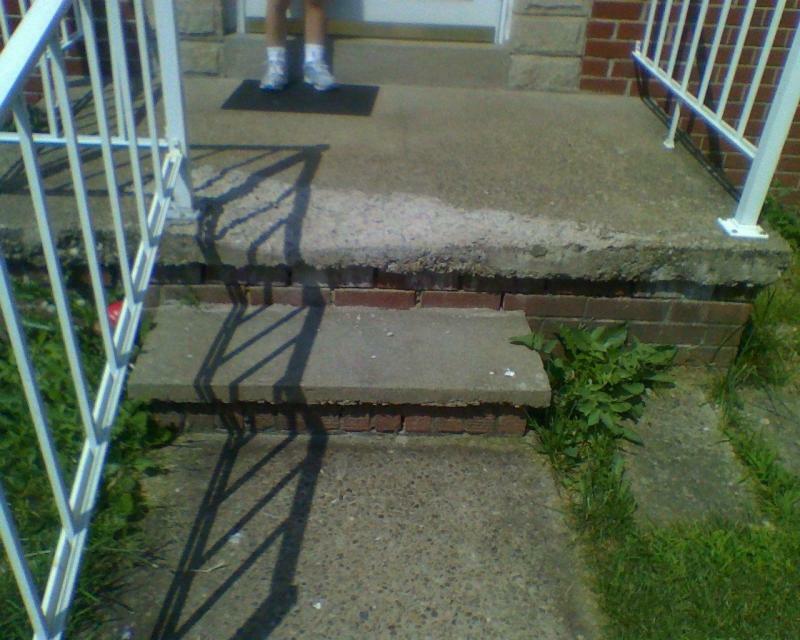 Once, unadorned cement steps projected directly out from the front door to the sidewalk. The homeowners, while using privacy and separation from the street as the incentive, reoriented the steps to rise alongside the house. At that point, a simple brick or block wall to enclose those steps would have been the easy, rote thing to do. 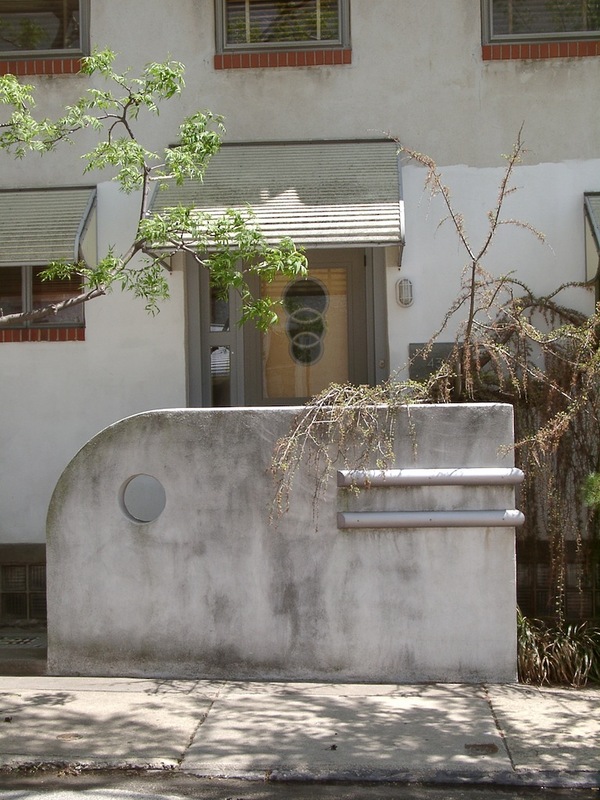 But with a bit of artistry and vision and a desire to express the individual likes and tastes of the owners, an Art Deco-inspired wall, complete with porthole, aluminum stripes and Streamline tapering became a landmark on the street, a unique, unmatched statement. 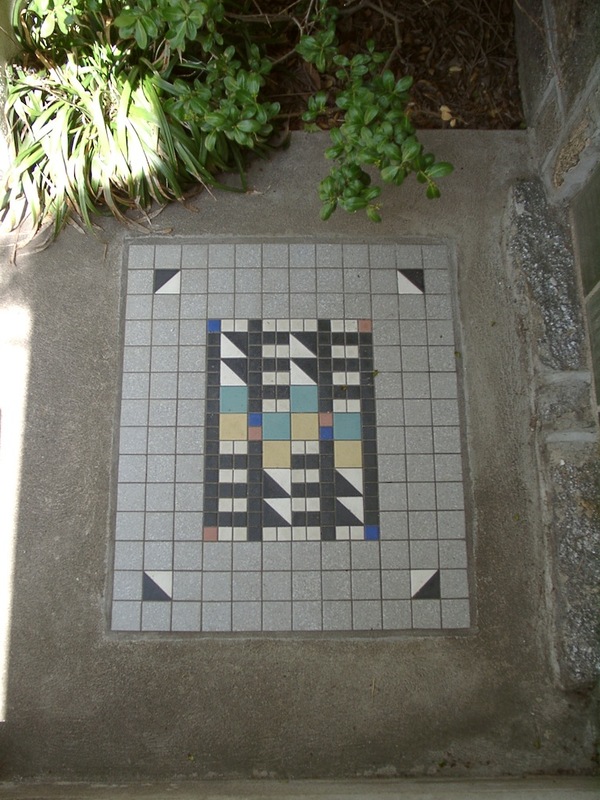 And then, even more: On a lower landing and on the top front step, on the spot where a typical mat might have been slapped down, there are owner-designed and -installed mosaics – a greeting and a tease of what (and who) await the new arrival. A blending of art and place, of pure function and pure imagination. Arslocii. Is it asking too much to hope that homeowners will see this “bonus room” as an opportunity for self-expression, even self-revelation, and that they will take a step in the right direction? Starting in the 1800s, New York City needed a bigger and more reliable water supply. 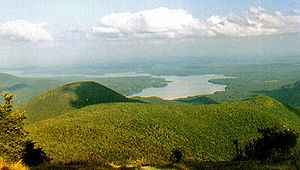 With so many of the water sources originating in the Catskills, the comparatively empty land was eyed for potential dams and reservoir sites. Towns in the valleys were vulnerable and seemingly dispensable to the state, and many were sacrificed for one city’s needs. The citizens were evicted from their homes and towns by the usual ploy, eminent domain. 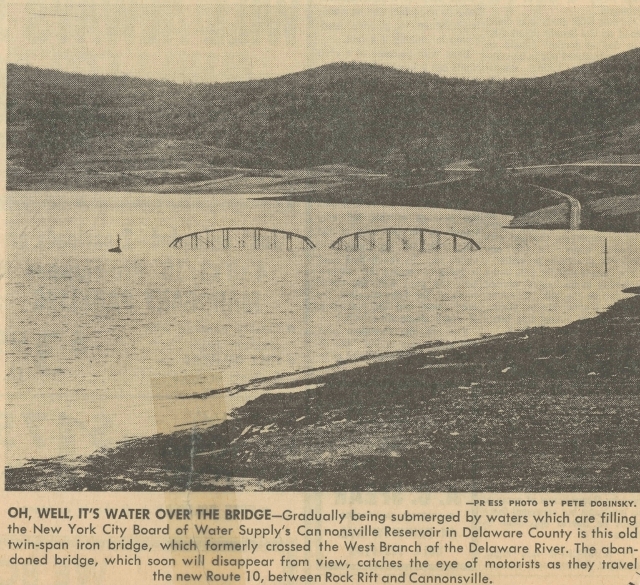 Dams were erected, floodgates were opened, New York City was guaranteed a huge, seemingly endless supply of mountain water. Mountain water that drowned towns. Whatever existed in the towns was submerged and diluted by billions of gallons, including moral turpitude. Some might consider it a crime against small town America. 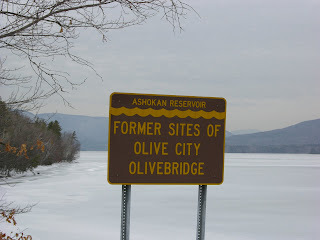 These disappeared towns, their fate similar in many respects to being outfitted with cement shoes, are referred to as “drowned towns” or ghost towns. Townsfolk’s lives were abruptly ended, they were transplanted to other towns or new artificially established ones. It has happened in many other states in our country, mostly in mountainous regions that have proximity to large metropolises which have no natural resources. Most likely those who are run out of town are rural and poor. Sacrifice of the few for the many. There are instances where water levels in the reservoirs decline and some of the towns become visible once more, hence the name ghost towns. (In fact, it’s happening now, in the Midwest, where the terrible drought is causing reservoir-buried towns to reappear in Indiana.) Talk about rising to the surface. Foundations, wells, even railroad tracks are detectable at times when water is in shortage. 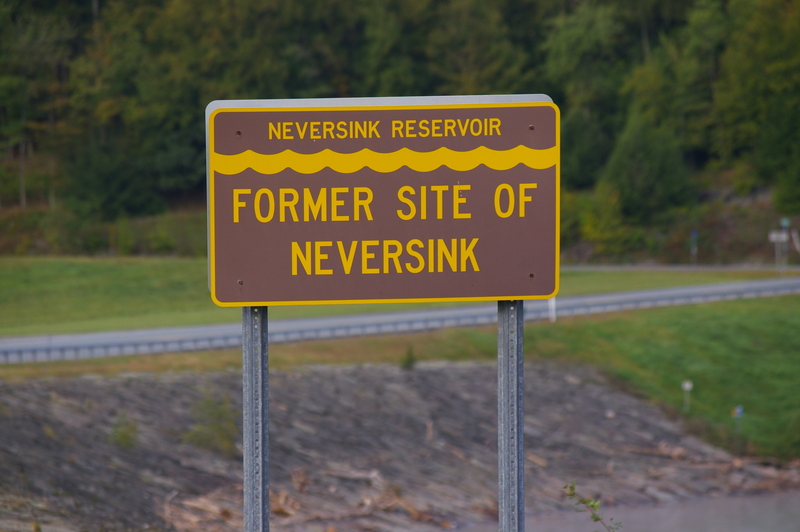 Ironic that the towns reappear when water levels are low – there are at least eleven reservoirs in New York state that evaporated twenty-five towns in their creation. Now there are scuba clubs that dive into reservoirs in search of these Atlantises of the east. 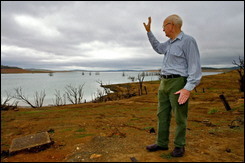 And there are descendants of the townspeople who gather, gazing longingly into the consuming and soon-to-be-consumed water when the levels are low, hoping to catch a glimpse of their homes, their history, their decades- and generations-long mistrust and dislike of the way they were pushed aside in favor of the thirsty giant downstream. In passing a number of packing, shipping crates lately that seem to be everywhere – on city streets, in suburban enclaves – it looks as if everyone is relocating. It got me to thinking about boxes. 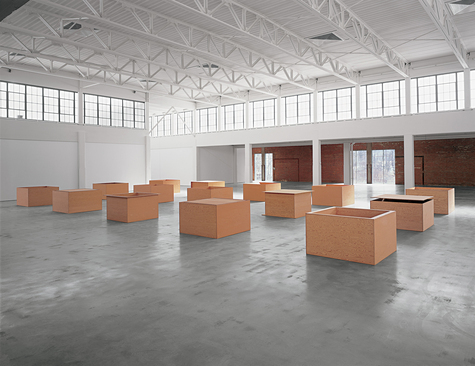 Obviously, Donald Judd was thinking about boxes long before this synapse occurred in my brain. His boxes are definers, forms, containers for space. I think he was prescient and profound about their metaphor for life because our lives are defined and contained by boxes. Cradle to grave. 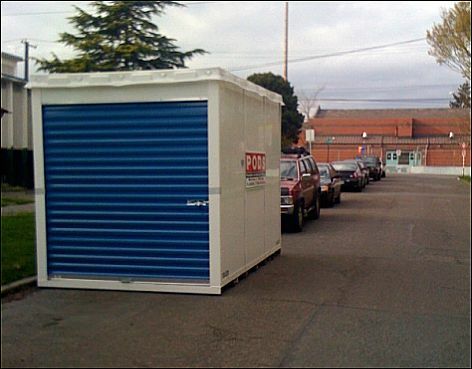 There is the large box we inhabit, whether it be apartment or house or office cubicle. A rectilinear world surrounds us, encases us. 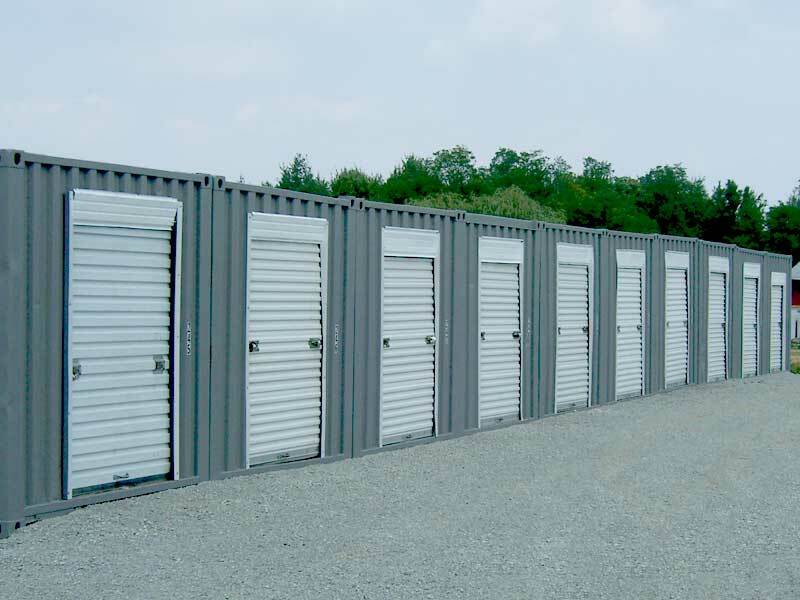 If our homes can’t contain all of our belongings, we rent a storage space – another box – unless we have a garage, also a box. 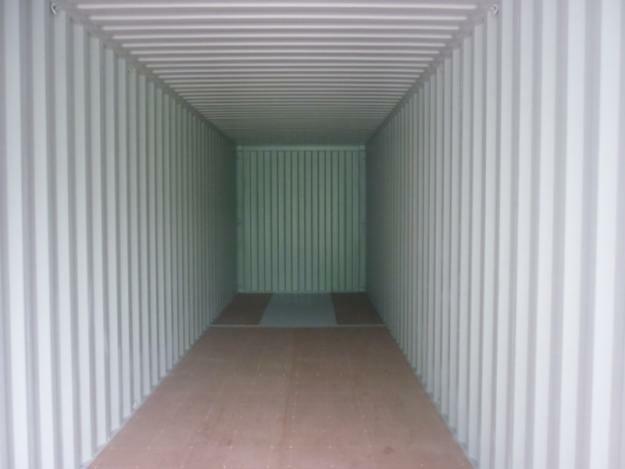 If we are moving to a different location, a structure is supplied in the shape of a pod, referred to as “container-based moving,” and it is a box for your belongings. Then we move and we find a place to live in that needs remodeling, so we bring in a Dumpster, a huge rectangular box to fill with debris; the unwanted stuff gets boxed and carted away. Often, too, the wanted stuff gets boxed but stays with us – look at all the plastic storage boxes you can buy at big-box stores. Many of our furnishings are, face it, boxes that hold other belongings. Our cars are just shiny, molded boxes – containers to move us from place to place – also with as many of our belongings as we can carry. 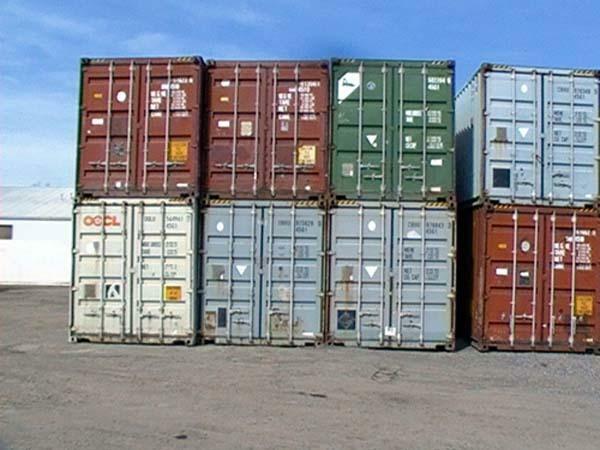 Overseas shipping containers are huge boxes that fit on boats, train cars and 18-wheelers – and they float. And, too, smaller boxed items are shipped everyday, everywhere by many competing shipping companies. Proposal rings come in small boxes, gifts come in boxes of all sizes; England and Canada, among others, celebrate Boxing Day. Books and DVDs come in boxed sets. Box seats are desirable to some theater-goers, if they can afford them. In the sport of boxing, somehow, the square stage of the event is called a ring, but we all know it is really a box. Heck, these days, even liquids come in boxes. A typical day could involve starting off with boxed cereal, working with text boxes and going out to check your post-office box before sending off a box of chocolates to an admiree and grabbing a Bento box for lunch unless you have brought along your own lunch box, then off to the box office to get tickets for a performance. Why do shoes come in boxes? Mass production, it seems. Funny how they can become stashes for treasured items like seashells and love letters. If you get on your soapbox, it may elevate you in a crowd but its useful life as a container happened before you came along; unless, of course, you might argue that it helps form and package your thoughts for a public forum. But beware, you might inadvertently open up Pandora’s box, resulting in a crowd-displeasing pummeling by round rather than square objects. Boxed ears can occur. Ultimately there is the last box. It can be made of wood, metal or cement. 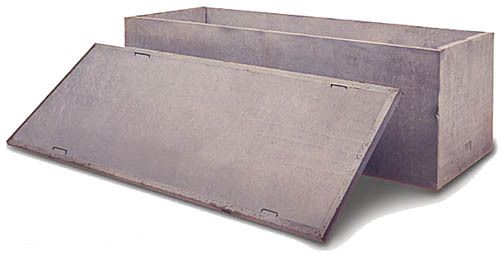 It can be lined or bare and it will contain for eternity, only this container must be contained by non-rectangular earth cut into a rectangle to receive the box. A fitting end for a square peg. Puzzling, this. One would surely assume – and, thus, one would be so utterly and completely wrong – that plants could only be good for an enclosed work environment, that their beauty and pet-like quality might help soothe those toiling in a pressurized and deadline-driven occupation, that the oxygen produced by personalized in-your-face photosynthesis might bestow on sleep-deprived and lung-capacity-diminished journalists a puff of non-caffeinated alertness, that having to occasionally water a bit of philodendron or petunia might demand a certain level of responsibility and interest in something other than self rare in this ego-drenched and cynicism-thick atmosphere. The owners of the building in which we now lease space expressed concern, apparently, that plants might add something unbalanced to the filtered and formulated air, and that these undocumented aliens might harbor insects that – what? – might ruin this year’s 3rd-floor-office peach crop? We were assured that professionals would be determining and providing the proper flora, and that they would maintain them with perfect light and hydration as only professionals can. OK. But, first, a bit of necessary background: The newsroom from which we were deposed by squeeze-the-corpse-dry owners – that storied, classic, fabled, memorable newsroom – was, let’s face it, a subterranean, black-lung-dispensing pit with carpeting that had not been vacuumed in anybody’s memory and twice that long for the cleaning of the air ducts (the most frequent sound in the place was not keyboards clacking but everyone sneezing), with oozings and droopings and ashy moundings and vending machines that dropped down items already chewed on by mice. Natural light came into this room only on the side of a beer can, and then it was spelled L-I-T-E. 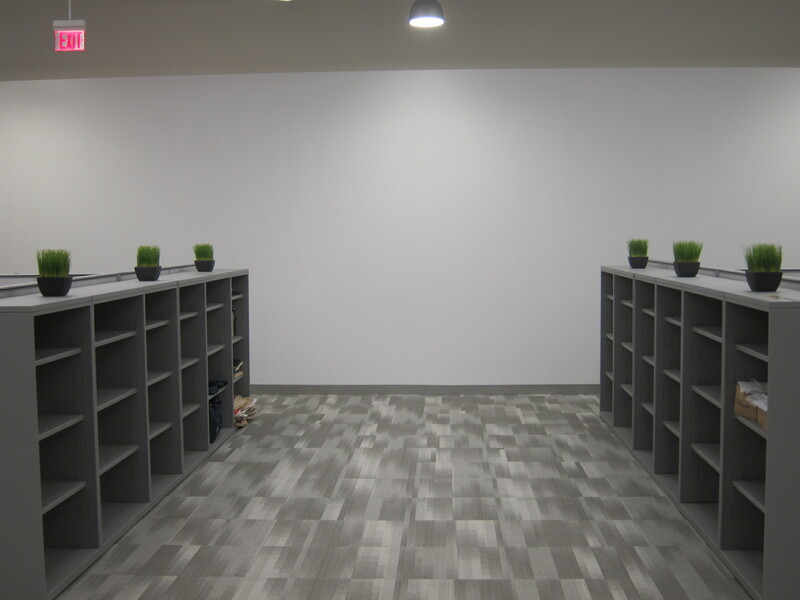 The idea that we bad-news bearers might have the urge to bring illicit contraband potted plants with us to the new clean-room office stumbles on the reality that the old office was so toxic it barely supported human life let alone pansies. The main reason we would not be bringing our plants to the new place is that we had no plants, in the way that sensitive couples decide not to bring children into this terrible world. And, so, when on a Friday we bade farewell to our beloved Superfund site and on that following Monday arrived for work in an entirely new environment, one so scrubbed and kilowatted and boxy and soulless, that not a one of us – trying to find our cubicles among the rat warren of minimum-security cells – gave even half a thought to potted plants. Until we saw them. In our area, 6 of them.In dark ceramic pots. About 6-inches tall, including the (now that we look closer at it) possibly ceramic pot. Looking for all the world like half a dozen packs of wheat grass waiting to be juiced. Aligned in two perfect rows atop facing walls across a work-station aisle from each other, they seemed – how you say? – disappointing? No – insignificant. Negligible. Puny. Absurd. Hilarious. I tried to pick one up, to see how heavy the pot was. I could not pick it up – it seemed, all several square inches of it, to be as densely weighted and gravity-redolent as a black hole. It was then I discovered that the pot – indeed, all of them – was glued to the surface, as if it were the Hope Diamond in a museum setting, held in place to thwart that menacing band of roaming wheat-grass thieves. The grassy stalks were so lushly green, so perfectly trimmed – I ran my hand across their crew-cutted top – so … artificial. Plastic. 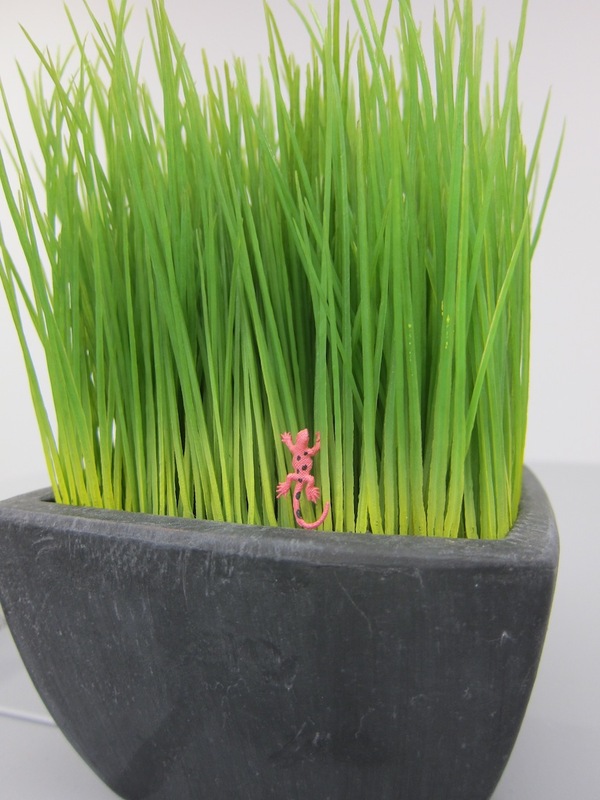 Plastic wheat grass. The perfect plant for this unliving George Tooker-ish office. It is somehow depressing to consider that these tinted and decorative bits of petroleum byproduct will almost surely outlive the enterprise that they have been drafted to decorate. The newspapers will be the stuff of memory and mold when these perky simulacra will be, unchanged, ever unchanging, the belles of the landfill. However, I have noticed something of hope. 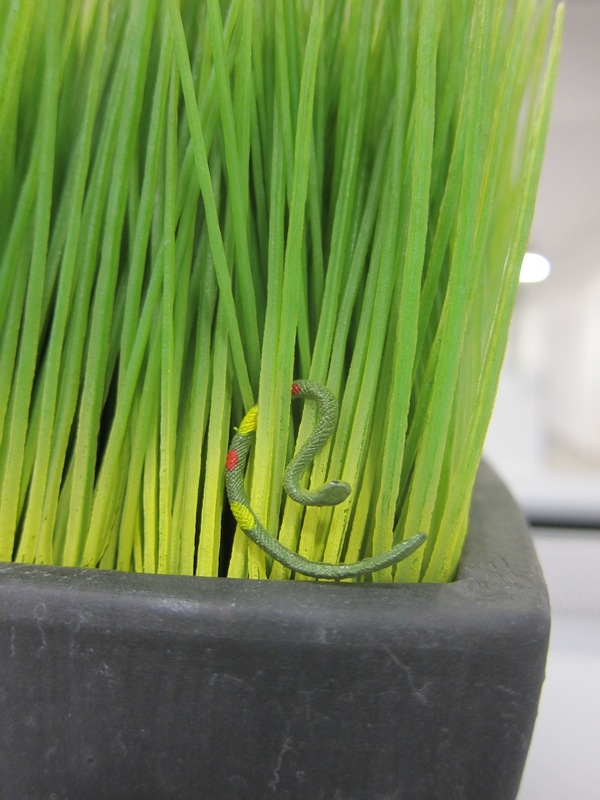 Recently, secretly, colleagues have begun to stick things into the artificial grass, and place things atop them, in ways that can only be deemed clever or, at least, anarchic. First it was candy balls – a sure sign of simple rebellion, but a serious one, because I know of no journalist who readily or easily lets food out of his mitts. Then there was the wag who, in a nice film reference, stuck a packet of artificial sweetener into the stalks: Splenda in the grass. Just the other night I became aware of tiny toy reptiles placed to lend a kind of jungle air to the thick growth – and, in a way, the plastic animals made the plastic grass seem more real. This is all good news. What is happening to these green accessories is what happens to statues on campuses that become the targets of student pranks and hazing requirements – old Civil War generals or figures personifying virtuous values suddenly, in dawn’s light, seen to be wearing sweaters or painted blue or holding a leashed goat or sporting a tattoo. 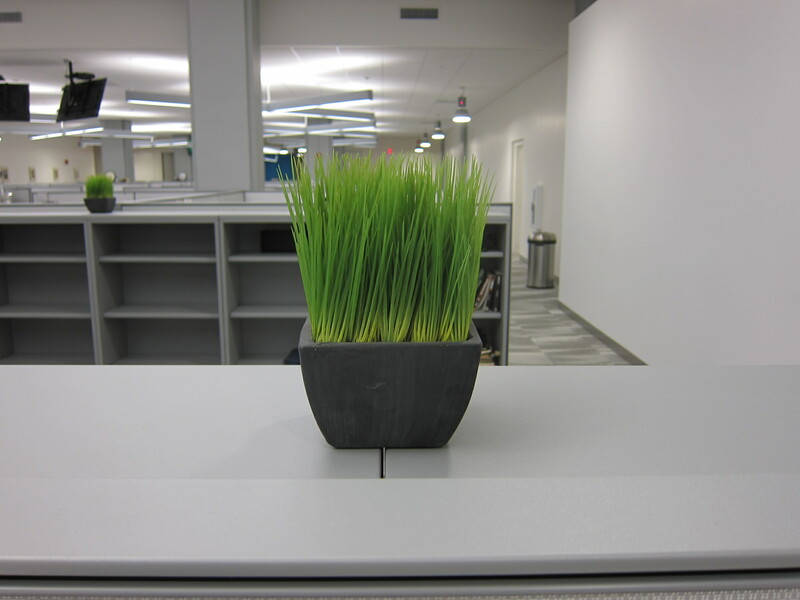 Our wheat grass has become the equivalent of this sort of ritualistic nose-thumbing; I can envision them becoming the repository of little Halloween costumes and Christmas ornaments, office supplies and all sorts of offensive stuff that will give vent to journalists’ sarcasm, darkness, insubordination, mistrust of authority and general screw-you pissed-offness. In other words, in some strange ironic way, these artificial plants will have brought something very natural into the newsroom, and given it a place to thrive. In the course of moving some items from one household to another, in among the objects were several clocks that had made the journey. These clocks, time machines of varying sorts, were unplugged in the morning and their faces reported the last moment before time stopped for them. They showed that they left one place at precisely 11:40 and although it was several hours later, in their deactivated state, to them it was 11:40. Stuck in time, so to speak, as the relentless coursing seconds, minutes and hours were literally standing still for these long-vigilant counting machines. I think I felt a little sad for them, removed from their tasks and losing their rhythm. We all accept the artificial overlay and concept of time and time-keepers. We may not be synchronized to Greenwich Mean Time, but we do obsess over delays or off-schedule events, by the clock. Look how time, split into hair-like fragments, determines outcomes of competitions. In areas that are prone to electrical surges or outages, the annoying distinction of digital clocks is that they go off but they come back on blinking in a kind of S.O.S. call that their workings have been meddled with – alarmist tactics that agitate rather than put the mind at ease, a crying-wolf pattern that ends up meaningless when something real takes place. Some of the older analog clocks have a colored dot that appears if the power goes out, just so you know – nothing pushy. Of course, the battery clocks are unaffected. They can stop, but never in unison – their trauma is individual, not communal. It was a bit unnerving seeing these recently moved clocks so disconnected, living in the past. 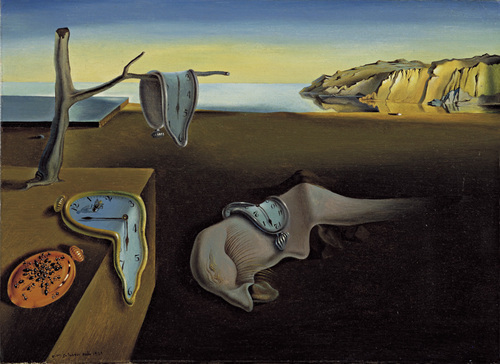 It made me think about horrible disasters – floods, earthquakes, tornadoes – that, when electricity goes out and life as we know it is destroyed, all the clocks stop at precisely the same moment recording the balance-tipping instant. In a sense, time has stopped and the time on the clocks has eternalized the event, the frozen hands imbuing a poetic sorrow with the real. Imagine how we would know from clocks the exact moment when the world ended, if we didn’t end, too. Except for the poor souls forever cast in stone after Vesuvius erupted, there is no other more telling a silence than a stopped clock. In toto, permanently and collectively stopped. I remember when my mother had her stroke while sitting at her computer and laid on the floor for we-didn’t-know-how-long. My brother was able to access the clock in the computer to figure out when it was turned on, what activities took place in a sort of log and when it went idle. It was fascinating, yet devastating. The computer’s clock told us more than we wanted to know about time stopping for mom. It became a witness to the crime, as well as a sleuth. 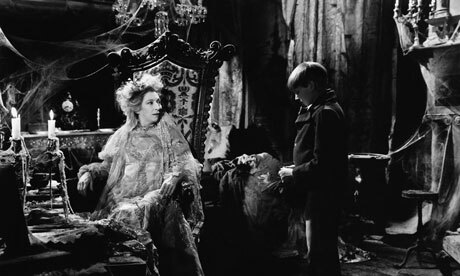 Miss Havisham ordered every clock to be stopped on her never-to-be wedding day, to live forever frozen in that time, as a constant reminder. Was it the moment of betrayal, the moment of thrill before betrayal, or the moment when the vows were to be spoken? Whatever, it was chilling. 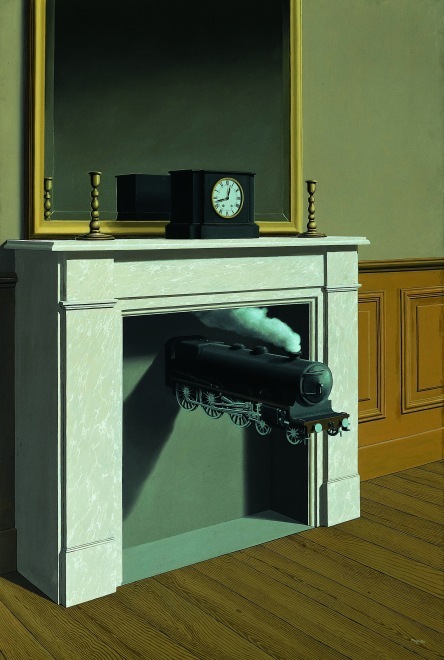 Magritte’s Time Transfixed illustrates this occurrence as a free-floating, unmoving locomotive and as a stopped clock. Both are powerful images of fate and loss, the human condition. Time is the human condition. Stopped time, for sure. So these clocks of mine that are temporarily halted have enough placeness to give me pause, make me extend their meaning to existential wonderings. We hear them tick as background, like heartbeats. And then they can quit, just like that.